On Tuesday night, April 13, 2004, in the midst of a concerted effort by Iraqi insurgents and Baath loyalists to disrupt the impending sovereignty date and transfer of power in Iraq, the President of the United States, actually dressed in a dark suit and purple tie, walked into a crowd-limited White House East Room to address his third news conference. He stands behind a podium and reads from a script. And in that, he makes small stumbles from time to time, losing his way once in extemporaneous question answering. He did not seem confident. He was most assertive when making the exclamations that have become his standard, like we will stay the course. He glances up at mostly the center-third segment of his audience and says that one of the reasons why the war he launched against Saddam Hussein is justified is because Iraqis have as much right to freedom as we do. And he went on to proclaim that American freedom is the God-given right of the world. Is it? Does the world, or do the Iraqis, really have a right to freedom delivered by America or another nation? Or is this another of those grand-sounding false premises? Did Iraqis fight for their own country, to take it from an uncaring and repressive government, as did American patriots when they took a British sword and forged a new nation with it? Did the American patriots expect anyone to hand their freedom to them? The only help they got was not to give them a birthright; it was given to hurt the British. So, it seems the reality of the Presidents vision is that America is playing to the Iraqis as France did to the American patriots, helping Iraqis attain their right to freedom when such help really serves other motivations. The Presidents voice had become a monotone static as I pondered the meaning of his proclamations. Are all cultures really ready for freedom? Do Iraqis have the values to recognize and honor the right of freedom for all of their own kind? And since we know they do not, can they then have even the concept of freedom within themselves to be trusted to represent it? Do they know that accepting freedom from others means that there is a responsibility to represent it honestly and defend it vigorously? That if they do accept it, they stand on the blood and cherished sacrificed lives of others? Would they really have any appreciation for that? The atrocities committed against murdered Americans in late April were witnessed by a population that has yet to show any such appreciation, by virtue of their unwillingness to come to the aid of justice, which must be a foundation for any real freedom to exist there. And there has been little aid to justice from their separatist communities in the United States, Spain, France, and Great Britain, to help in the search for known and suspected terrorists in their midst. The President, not a speaker who gestures too often, hands grasping the side of the podium most of the time, also said that Freedom is not easy to achieve. Where, then, has the Iraqi sacrifice and drive been in the last decade to make the hard change? American patriots left their homes and wives and children and farms and shops to secure the blessings of their liberty. Where has been seen any such give-your-all sacrifice for freedom by the multitudes in Iraq? Are not the sworn police and security forces, those who can defend the best chance for a gift of freedom that Iraq ever has had or will have, refusing to stand up for a transition that can bring rule by their own leaders, and freedom? Are they not even deserting to join those who are fighting American liberators? The price American patriots paid to take America was too great to devalue it by anointing their reward upon the people of any nation when those people did not, and are not willing to earn it, when the freedom they are to receive is paid for by others, by American patriot soldiers. The President never could have thought to say any of this, but he did say that if we spread freedom, (his main theme, which really translates into government sponsorship of global, corporate expansionism, human- and commodities-resource development) around the Middle East, terrorism can be defeated, and that social services all of Americas citizens do not even enjoy will be provided to the people of the Mideast, thereby supplanting violence. This is the roadmap, with unknown destination and cost, with which the President drivesnot the summer trip to a June handover-of-power ceremony in Baghdad. Whether or not America can really afford to bring freedom (or a crusade) to the world should be a major question answered by each citizen before casting a ballot in the November election, because President Bush has made it clear that America is to be the worlds Santa Claus and vehicle of spiritual deliverance during his watch. And the president was the first one to use the term crusade, which prompted his people to quickly tell him not to be so quick to remove his hood, and he has avoided the term since, seeming to almost say it, wanting to say it many times since, including at the last debate. But to that, any American can rightfully say to the president, Its your religion, but its my government. Keep your religion out of it. Thats the way it has been and the way it should stay. Government cannot be a part of the broad spectrum of religious beliefs (and non-belief) for everyone, and no groups religion should be a part of or be served by a government that belongs to everyone. To do so arbitrarily puts every citizens money into some religions collection plate, and thats not the worst of it. The best thing the government can do, for itself, for every citizen, and for religion, is to respect and obey the separation of church and state that has evolved from the establishment clause of the First Amendment to the Constitution. Otherwise, religion becomes an object of competition for resources and another source of bitter division. Bushs faith-based initiatives, instituted through executive orders to bypass Congress, provides taxpayers money, through grants, to religious groups, and at the same time, it allows them to discriminate in hiring and disbursement of those taxpayer funds. Of $1.5 million already spent at this writing by seven administrative organizations, including the Department of Justice, and HHS, discriminatory exclusion has already appeared, with not a cent going to Jewish or Moslem groups. A lawsuit against the administration’s faith-based programs (Hein v. Freedom From Religion Foundation, No. 06-157) has progressed through the court system to the Supreme Court, where the administration’s appeal of the Circuit Court of Appeals’ decision to uphold the lawsuit will be heard in February. The lawsuit alleges that administration officials are unconstitutionally using tax dollars, violating the separation of church and state required by the Establishment Clause of the First Amendment. Whether Bush’s loaded court will enforce the Constitution or, instead, fall under Bush’s constant charge against so-called “liberal” judges of creating law, by striking down the lawsuit, remains to be seen and will be the most important decision yet to be issued by the Bush-configured court. The armed forces are for defense, not to bestow freedom, not for crusades. We have a Department of Defense, not a Department of Liberation, or Religious Endowment, or Spiritual Righteousness. But Bushs absolute religious language says otherwise: We will rid the world of evil doers, instead of, We will defend against all enemies. 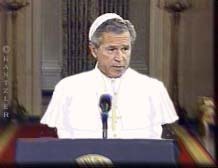 And with his biblical proclamations, Bush creates a nationalist theology, turning Americas defensive might into the biblical force he quotes: the light [that] shines in the darkness, and the light that will not be overcome, and in his concluding remarks at the first debate, Weve climbed the mighty mountain. I see the valley below, and its a valley of peace. Tell that to the more than 3,900 dead U.S. soldiers and thousands of Iraqis and other nations citizens. Is it any wonder that large parts of the Arab world, and non-Arab nations, see America as being on a crusade, engaged in a religious war? Now, with the election over, in his victory addresses, Bush has dumped all pretense about Iraq and his intentions, saying that he has a mandate to lead America into a struggle to bring freedom to the world. Even so, Bushs definition of freedom in this context is a metaphor for greed-based aggression in a grab for new markets and industrial-commercial resources, with whatever motivations of personal ego thrown in for good measure. But, in the end, the President was really very fortunate with the outcome of this late-term press conference. The press obliged him by following his 18-minute-long opening speech with short-sighted questions: little, feudal, harmless Iraqfeudal, because in the Middle East, apart from major cities, national government is often more about control of resources than it is about maintaining the rule of law within the whole of a nations borders, which falls to the whim of ethnic, regional, tribal leaders, who compete and war against each other to expand their influence. Iraq and 9/11 history were the subjects of all the questions asked. Despite a single, brief, non-aggressive reference by the president, there was no one looking ahead to Iran or North Korea and the looming nuclear demise, and the president and vice president made no plans clear to deal with them at their first debate, either. Confrontational questions on that would have provided an interesting answer to hear, or watch, in lieu of any intelligible utterance. Now, he must face the responsibility of dealing with those real and imminent dangers while extending Americas military and economic resources beyond the point of responsible reserve in a defensively unwarranted and unnecessary war against an innocent population in Iraq, tying his own hands as he enters his next term facing Iran, North Korea, Afghanistan, and wherever next the terrorism trail will lead. But under the hot Texas sun and the brim of his cowboy hat, thats all right, because it isnt all about national defense and terrorism, after all. Last update: November 5, 2006.
this copyright notice and the top-page header images and data are included in the reprint.